Burgess Hill Town Football Club have two chances to try to pull themselves up from the foot of the table in a busy week. They lie second from bottom of the Bostik Premier League but are level on points with basement side Tooting & Mitcham. In a busy run-in to the end of the season, they play their third and fourth matches in eight days at home against eighth-placed Leatherhead tonight (Thursday), kick-off 7.30pm at the Green Elephants Stadium. They then make the 286-mile round trip to Suffolk to face sixth-placed Leiston on Saturday. Following a heroic 1-1 draw at home to promotion contenders Dulwich Hamlet on Saturday, Hill suffered disappointment on Tuesday night with a 4-2 defeat at home to Enfield Town. The Hillians twice got themselves back into the game, courtesy of goals by Lee Harding and Jack Brivio. But the visitors were clinical and took all three points thanks mainly to a hat-trick by Simon Thomas. Dernell Wynter gave the visitors the lead in the 16th minute with a scuffed shot which trickled into the net. Lee Harding put Burgess Hill on to level terms on 34 minutes with a cross which beat ‘keeper Joe Wright at the back post. However Thomas regained Enfield the lead just before half-time, rising highest for a headed goal. Chapman made a change at half-time by bringing on Aaron Smith-Joseph in place of Josh Greenleaf. But Thomas extended the lead for Enfield nine minutes into the second half with a breakaway goal. Brivio made it 2-3 when took advantage of a goalkeeping error by putting the ball away after Wright spilled Smith-Joseph’s cross. 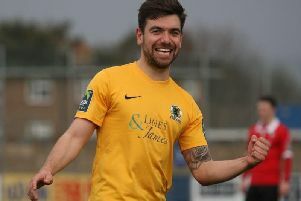 But hopes of Hillians getting anything from the game disappeared when Thomas scored his third goal and Enfield’s fourth on 65 minutes when he beat Gary Elphick for pace and turned the ball into the net.